Most of us have taken a handful of something and tossed it outside for the raccoons or deer that pass through our backyards in the night. We feel that we are helping them make it through the long, cold winter by providing a little treat. Some of us have even had wild animals eat from our hands. We think it is so cute that they trust us. The truth is feeding wild animals does them more harm than good. To start, human food is not good for animals. The more we feed them, the more they expect it. Human grade preservatives, food colourings and all the other things in that food are not meant for consumption by an animal. It is quite possible for you to pass along disease to animals by hand feeding. Secondly, large, potentially dangerous animals may become too comfortable and could eventually become a nuisance or worse yet, a threat. An example of the harm we cause is Halls Road in Whitby. Many people think it’s cute to hand feed apples to the deer herd that populates that area. It’s an apple. What harm can it do? The apple itself isn’t the problem. The problem is that the deer now see people as food providers and so the deer are hanging out on the road, where the people are. Several deer in that area have been struck by vehicles due to their lack of fear of the road or humans. 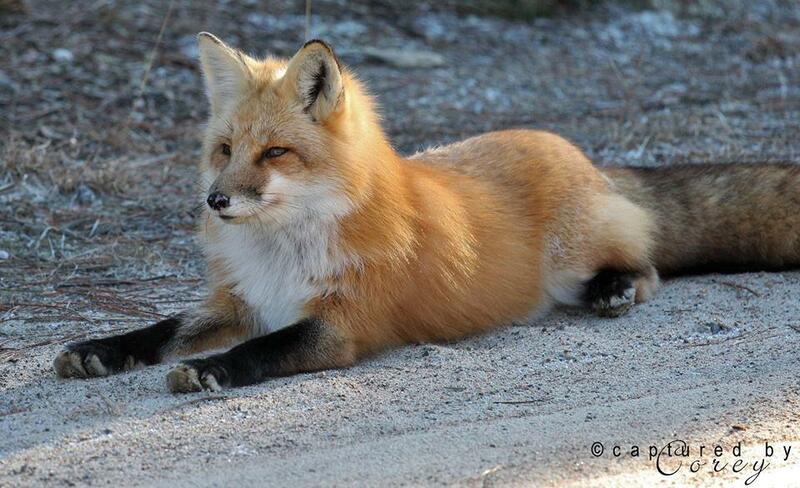 Another example is the Red Fox family of Algonquin Park. The patriarch of the family, now dubbed “Old man Algonquin”, is safe at Aspen Valley Wildlife Sanctuary, where he will spend the rest of his life protected from human interference. It all started with a couple of park visitors throwing food to him from their car. Their photos were amazing and they shared them on social media. Soon, all the wildlife and nature photographers wanted to see this “friendly fox”. Over several years, people would come to the park to see him and his family. He soon realized that slowing cars and slamming doors signified a meal for him so he learned to stay close to the road and listen for humans. Eventually, he and his family were hit by cars and were living with terrible injuries that prevented them from properly hunting. Some of the kits were killed following dad onto the road and not realizing the danger of cars. In the end, he could barely walk due to his injuries and the MNRF gave permission to Howard Smith of the Aspen Valley Wildlife Sanctuary permission to trap him. People thought they were helping the injured fox by feeding it but because he was getting fed by people, he was not interested in what was in the traps. It took 25 days for Old Man Algonquin to finally be captured and receive the care he needed. Wildlife don’t need our help and they should never be baited with food so that you can get a selfie. Let wild animals remain wild.